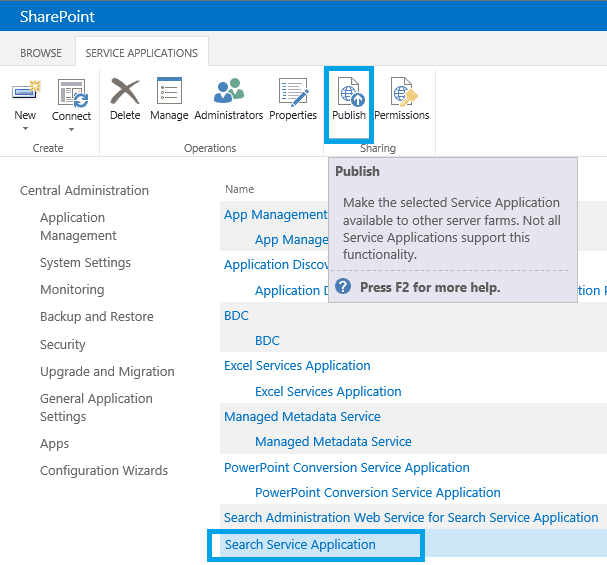 To start the process of cross farm service application publishing in SharePoint 2013, first look at the post about establishing STS trust between farms. You also need to have the farm IDs of the farms that are going to consume the service applications in hand. 1. On the source farm, go to Central Admin -> Application Management -> Manage service applications, select the one you want to publish (in this example Search) and click Publish from the top ribbon. 2. Select the "Publish this Service Application to other farms" option. I recommend using https connection. Take a note of the Published URL and save it. 3. Grant permissions to the consuming farms on the source service application by using the consuming farm IDs. 4. Now, go to the consuming farm(s) Central Admin -> Application Management -> Manage service applicatoins and click Connect. Now insert the address that you've saved in Step 2. The server hostname in the example screenshot is removed on purpose. 5. Now choose the service application that will be provided as a choice to you. In our example - Search Service. Leave the option “Add this service application’s proxy to the farm’s default proxy list” ticked and click OK.
6. On the next screen, you can choose a name of the service application. Finally you'll get a confirmation that you've connected successfully.